Fishing is an activity available by interacting with the chair at the end of the pier. A fishing rod is required to play the minigame and it can be found in the attic: take the small key in the home entrance and the stool in the garage, then open the attic door upstairs. Three different fishes can be caught regularly: sea trout is attracted by worm, snapper by the lure, and mackerel by the special lure. Later, a unique fish named "Tigger" appears, which is also attracted by the last lure. There is no fourth bait despite what the board on the pier displays. First, choose the right bait depending on the type of fish you want to catch. 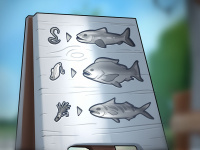 Then use the arrow keys to line-up the bait. Anticipate the position of the fish, the lower it is, the more it shifts to the right or left before the hook reaches it. Press Enter or tap the screen to drop the line. When the bait hits the fish, validate to bring it up. Aqua is a monster girl who lives in a lair in the ocean. Its weak point is its attraction for shiny items. Drop the special and golden lure above the hole in the seabed. Tigger is Terry's archenemy: the fish took his toe years ago. In order to encourage the captain to retire, the main character has to catch him with the special lure. When Tigger's head just covers the red crab, drop the lure above the sea pearl. Captain Terry buys each of your fish $80. Succesfully catching Aqua and Tigger in the fishing minigame allow you to progress in Aqua's route. This page was last edited on 9 April 2019, at 13:28.